Kudos to Yahoo! for finally starting to roll out BBAuth, a simple consistent authentication scheme across their services. This is one of a number of different but similar attempts at providing a simple Web based identity scheme. Dare squints hard and spots the difference between this and Google’s Web Proxy Authentication (photo), but I’ve lumped them together with the Atom PP technique as “HTTPS/URI Hashing” in a recasting of Patrick Harding’s Diagram (above). BBAuth does enable interesting interactions between third-parties, federation if you will, such as MOO printing private photos from my flickr stream. But I still feel it’s not a lot further to the top right than say Passport (photo). 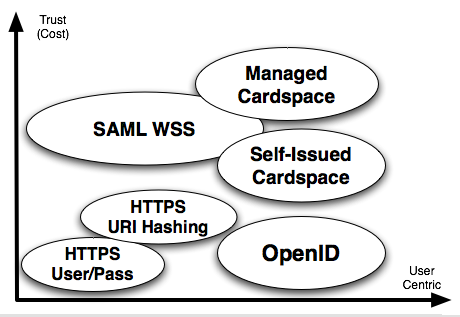 Technorati Tags: Google, HTTP, HTTPID, identity, infocard, openid, CardSpace, xtech, Yahoo! A Whatfettle article by Paul Downey published Sunday, October 1st, 2006, at 8:03 pm under a Creative Commons License.